There are no more struggles to get her to wear her glasses. She picks out her pair (we get two pair so that she always has a back-up, and has a choice) first thing in the morning, and puts them away right before going to sleep. I know that some kids her age are resistant to glasses, but I think because she can’t remember a time without them, there’s no resistance. Even now, this photo makes me want to run and get a glasses cleaning cloth. The glasses stay so much cleaner! 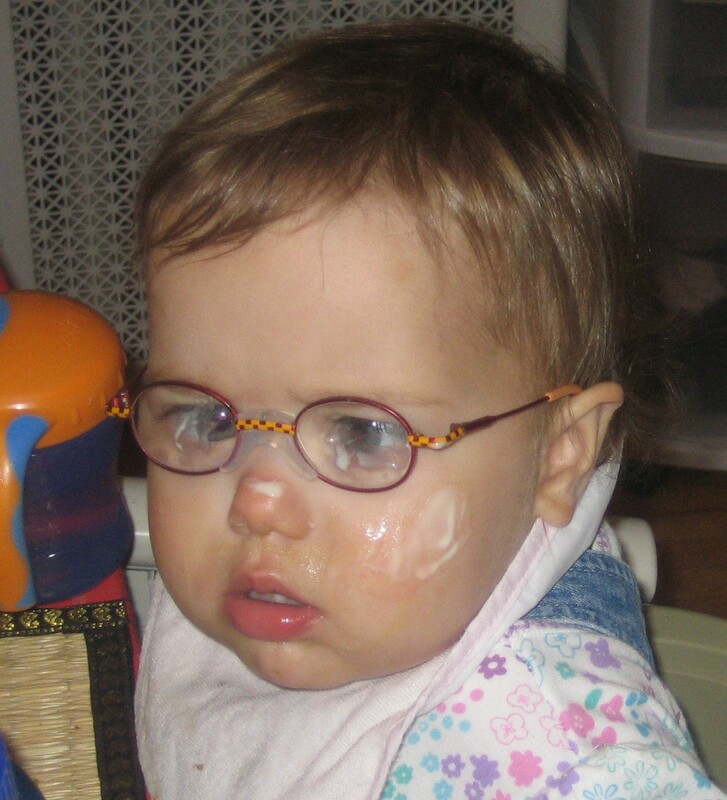 Now that she has learned to eat without getting food all over her body, her glasses don’t get nearly as dirty. And she is old enough to know how to clean her glasses herself. Choosing glasses is both easier and harder. No more crying and struggling to get frames on a wiggly toddler at the optical shop, and there’s so many more options for an 8 year old than a 1 year old. But now she has Opinions. I like that she has opinions, and so far, I’ve loved the frames she’s chosen, but the more opinions there are, the more complicated selection can get. Most of the anxiety around glasses is gone now. I feared that we’d lose her glasses, and now seeing how she loves to wear them, I’m less worried about that. I worried that she would beteased, but so far, that’s not the case. I was afraid she’d always be known as the kid in glasses, and while that was a little bit the case when she was younger, it’s much less of an issue now. I was scared about the problems she might have due to her vision, but that fear has been replaced by wonder as I watch her become an independent, awesome 2nd grader. ← Videos of babies getting glasses for the first time… and seeing! I know this post is from last year but your story just really touched me. My 2 year old daughter was just diagnosed with accommodative esotropia and astigmatism and she needs glasses. I have so many emotions going on right now and I guess I’m just trying to process. I am really thankful that I have found this blog and the stories in here are really helping me process this. My main concern is that my daughter is a very active 2 year old. She loves to run and climb and play and is so busy. I guess I just worry that her glasses with restrict her from doing all the things she used to do. Did you experience this or do you have any advice for me as we start this new journey? Thanks! Hi Ashley, I’m sorry I didn’t respond sooner! Zoe has always been active as well, and we’ve never seen her glasses get in the way of that. I would just make sure that her glasses fit well and are adjusted correctly. That way they will be a lot less likely to fall off or slide down her nose.